no mas pantalones: The 7 Line "Home Sweet Home"
The 7 Line "Home Sweet Home"
My Mets may have lost on Monday, but man, another great Major League Baseball Opening Day is in the books. My gameday wardrobe always includes something from The 7 Line, an independently owned and operated brand started by a fan in 2010. This year's Opening Day was a particularly special one for them, as they debuted a new in-stadium kiosk selling their shirts as an officially licensed MLB brand. 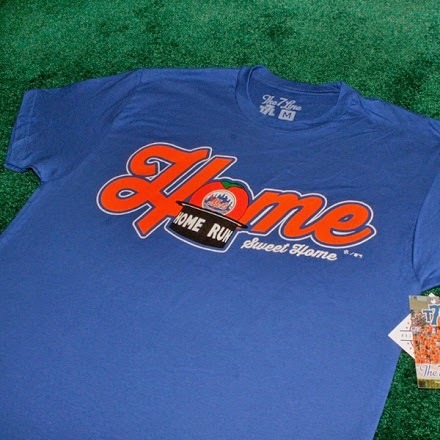 The ascent of the Home Run Apple is one of my favorite sights at home games (it signifies a Mets' home run), so I had to add the "Home Sweet Home" tee to my collection. You may not be a Mets fan, but I almost guarantee there is a fan putting out unique t shirts proclaiming love for your favorite baseball team. No one quite understands your joys (and sorrows) during the season as well as a fellow fan, and you won't end up wearing a shirt that is nearly identical to that of an opposing team's fan (with the exception of the colors and logo). There is also a good chance the shirts will be at the very least printed here in the U.S.A. I covered the National and American League East and Central teams in separate posts last year, and hope to cover the West later this season.